Casa de Linda Art Studio offers art classes for adults and children, and is the working studio of Linda Calvert Jacobson. 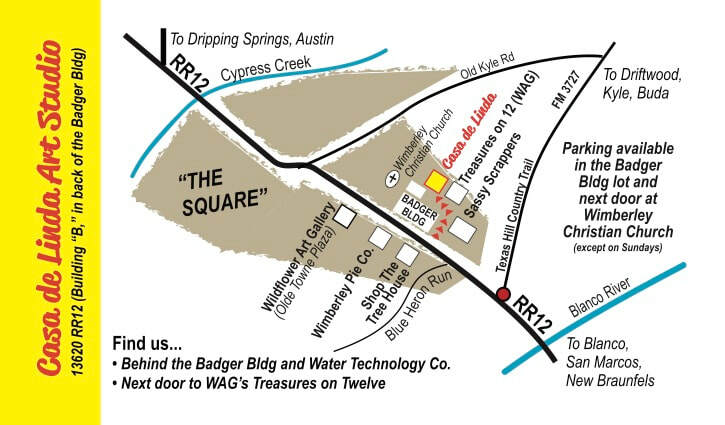 Located in the heart of Wimberley, Texas, a short stroll from the Square. Linda has been teaching art off and on since the mid1970s but her current journey began when she joined the New Braunfels Art League (NBAL) in 2003. Working a docent day in the gallery each month, Linda almost immediately began to see a need for children's art classes. Soon she was teaching a Saturday children’s painting class in a back room at the gallery. As the moms saw what their kids were doing in Linda’s class, they began asking if she would teach adults too, which she did. Within less than a year was able to rent a studio above the gallery where she could set her own teaching schedule through her new business, Casa de Linda Art Studio & Gallery. In the Summer of 2004, Linda offered a few weeks of Summer Art Camps for children, a program that has grown over the years. David also joined NBAL to exhibit his photography and help with Casa de Linda Art Studio as needed and the business grew. From 2010-2013, the business expanded into a storefront/retail location on Business 35, which was called Casa de Linda Art Center. About that same time, Linda began inviting other artists/teachers to offer classes for both children and adults through Casa de Linda. Linda and David closed the Art Center in 2013 to focus more on traveling for shows and gallery visits, but continued offering classes at the studio in downtown New Braunfels. The BIG MOVE...TO WIMBERLEY, TEXAS! In early 2017, Linda relocated her studio from New Braunfels to Wimberley. The space is not only larger and more suitable for both classes and as her working studio, but it's also just across the street and a few doors down from Wildflower Art Gallery, which her husband, David, manages. As always has been the case, when the studio is not being used for teaching, Linda will "hide away" there to work on her own art and paint her wildflowers. The studio is not open to the public nor does Linda keep any regular business hours there. However, she is available by appointment and occasionally will schedule a Studio Open House or be open for downtown events. Be sure to sign up for Linda's e-news to stay in the know about what's going in Linda's "life as an artist." To read more about Linda, her art and more, click here to visit her "about page" at www.lindacalvertjacobson.com. Please visit and like Casa de Linda Art Studio page on FB, Linda’s artist page on FB as well as the Wildflower Art Gallery FB page. After graduating Floresville (Texas) High School in May 1975 and trying one semester of college that fall at nearby Southwest State University in San Marcos, I returned home, bought a small kiln and 13 molds, and started a hobby ceramics, arts & crafts business the following year. This sign was on the side of a portable building next door to my family’s business, Carlean’s Dairy Dream, which was located about a block from the Wilson County Courthouse in Floresville. As Linda’s Arts & Crafts grew, my sisters, brother and even my dad got involved. We moved twice, in 1977 to a retail storefront in downtown Floresville and, again, in 1980 to a two and one-half acre complex that included a 2,500 square foot building for sales, classes and offices, and 4,000 square foot quonset hut for production. The name was changed to Linda’s Ceramic Supply of Texas and the business became a leading retail supplier and wholesale distributor in South Texas for ceramic greenware, glazes and related merchandise. Between the set backs in the economy and changes in the industry, along with the death of our father and other personal issues, we closed the business in 1985. This sign is one of the few things left from that period in my life. It now hangs in my studio in Wimberley.